Friday, February 25th, 2011 | 11:21 am	and filed in Reason, Gear. I recently performed a live set [video] where I was asked to use ReBirth for iPad. To complement the 303s and RB drums, I built an effect and loop system in Reason 5 that would allow me to process the ReBirth audio in real-time. Additionally, I had all of the Reason parameters mapped to a Livid Instruments OHM64 control surface. This “live set” configuration used the hardware interface audio inputs to route the iPad audio into the Reason effects, and the ReBirth patterns and Reason sequences were switched in and out via the OHM64. In practice this live setup worked great…but at the party, I couldn’t hear the tracks over the noise. This made it nearly impossible to synchronize ReBirth with the Reason song file, so things went pretty badly. Were it not for the OHM64 (and the open bar), it would have been a complete mess. I had enough material preprogrammed and mapped to the controller, so it was easy to fade out the ReBirth parts and improvise on the fly. It’s too bad that I couldn’t pull off the set better, but I left with a better appreciation for the OHM64. The video above demonstrates the layout of the controls mapped to Reason. The remote files and livid lua codec are hacked in a manner that bypasses the midi note mappings. The controls are manually assigned to the various parameters in the Reason rack. The image below describes the various knob, slider, and button assignments. The Measure Counter and Beat Counter section are triggered with a MIDI sequence that toggles the state of buttons on Combinators. These buttons are then mapped to the top row of the OHM64 and change state as the sequence runs. It’s not a perfect solution, but it certainly helps me keep track of the relative position in a musical phrase. With the beat counter and transport controls mapped to the controller, it becomes unnecessary to look at the computer screen. The song file is essentially a 16 measure phrase that endlessly cycles. The two Bus effects are beat repeater/jugglers based around the CycleOn combinator, and the master fx are two custom patches with one-shot insert controls that engage and disengage in time with the track. A battery of Dr.OctoREX loop players are routed in parallel through two mix busses. Each bus has an insert effect which can be triggered to drop automatically on beat. This allows you to trigger an effect and fade into a different loop. In addition to the loop players, there is a Kong drum machine loaded with 16 NurseREX modules. The Kong is controlled by a Thor step sequencer which sequentially triggers loops over two measures. 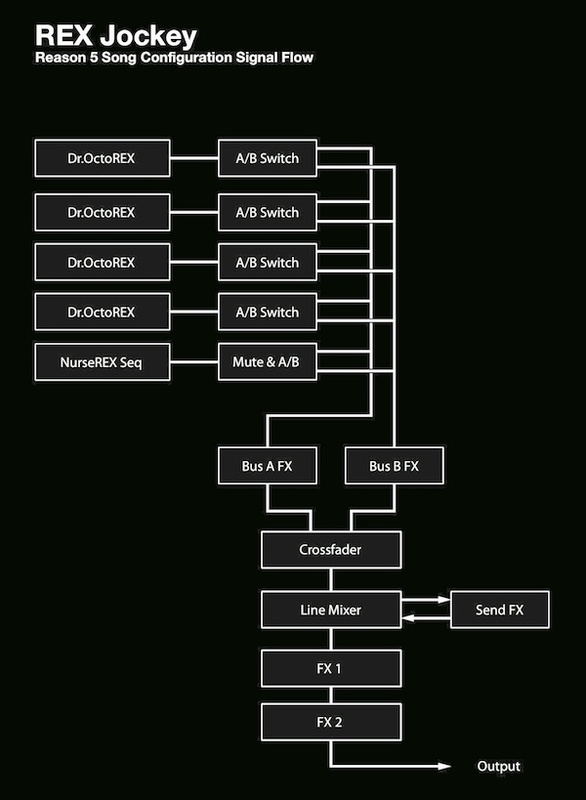 The image below describes the signal path from the Dr.OctoREXs and the NurseREX sequencer through the switching matrix, effects, and crossfader. The flowchart illustrates one way of organizing sound sources. 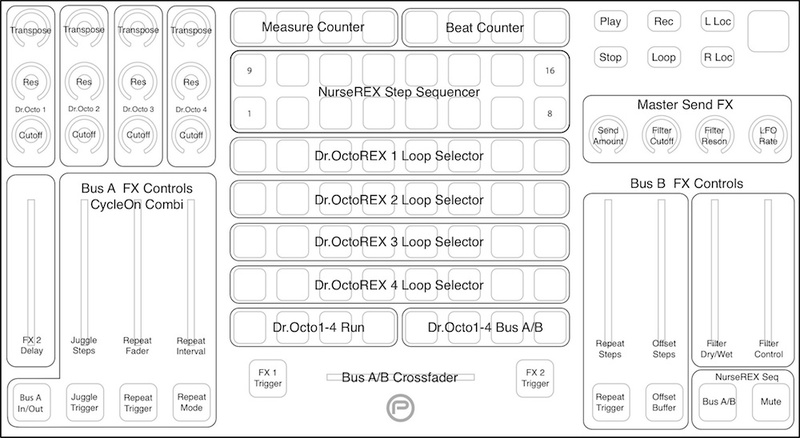 The Dr.OctoREX Loop players could easily be replaced with Redrum Drum Computers, Synths, or Samplers, and controls for pattern sequencers can be mapped to allow real-time switching. The archive includes a Reason song file with the remote override mappings set for a Livid Instruments OHM64. Also included are the Livid.lua file and Livid.luacodec which replace the default lua codec files. Also the Ohm64.remotemap file must also replace the default map before the setting function properly. For the end user who has both Reason 5 and an OHM64, this Reason song file can be used as a template. Customize the setup by loading your own ReCycle loops into the four Dr.OctoREXs, and by modifying the loops loaded in the Kong embedded in the “NurseREX SEQ” combinator. Save the song file and the mapping will remain unchanged. Certain features like the effect triggers will not function without proper mapping, so this file is not compatible with devices other than the OHM64. The following file is a demo session sequenced in real time using the OHM64 using the sample set from the video. The file is in the published song file format, but the controls are still mapped to the OHM64. Users with other control surfaces can experiment with this file to get a feel for the system. In the future, I will break down some of these structures, and will post some generic example files for the control system.